In the 21st century, there is nothing more important than doing regular exercises. However, a challenge comes when choosing the right exercise program. Picking the right exercise program is a daunting task especially when one is a newbie at it. Nonetheless, getting in shape does not mean that one has to scale mountains or hit the pavement for a strenuous run. The first step could be using a rowing machine to improve one’s overall health, and due to its low impact, it is easy and less strenuous for all ages and fitness levels. Essentially, a rowing machine is a piece of tool that mimics the motion of a rowing boat in the water, making it a full body workout equipment. A rowing machine is a piece of ideal equipment for weight loss, toning and building muscles while increasing strength. It is a game changer especially for those that love to exercise and keep their bodies fit. The strenuous part is always choosing the right rowing machine to offer the best results. 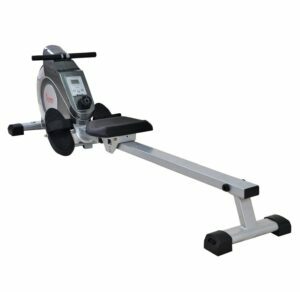 However, we have made it easier for you by selecting the best rowing machines within different classes, price tags and build qualities. The first rower in line is from the Water Rower Company known for offering its customers equipment of exceptional quality and design. This rowing machine is the holy grail of fitness. One thing that stands out with the device is its beauty. It is a piece of unique art, and you can quickly put it in the living room without any worries. It is also very quiet, and you can use it while watching your favorite TV shows or when enjoying the gentle splash sounds made by the water. Another thing, this rowing machine is a smooth operator with no jerky motions at all. The seat glides effortlessly along the rails. It is handcrafted from solid ash wood and finished with a honey oak stain and danish oil. Its Waterflywheel is designed uniquely emulating the dynamics of a vessel moving through water and undefeated in its physical and physiological benefits of rowing. This is a Rowing machine from the Sunny Health Company. It boasts of five significant things. One, it’s water performance feature that ensures the user enjoys a smooth and steady rowing experience with the flywheel and the steel fan blades offering the user an out of this world experience. The second feature is the design of the machine. It comes with sturdy steel to improve performance and increase durability. Along with the stainless steel design, the rowing machine has three hydro blades that mimic the movements of competitive rowing along with sweat resistance bars. The third feature is the rowing machine’s ergo-efficiency. The seat is built with the user in mind. It is padded increasing the machine’s comfortability and functionality. Also, by setting the seat at a high level, the user can get on and off it without straining the back muscles. The Forth feature is fitness technology with the R2 Fitness Meter designed to track all essential workout metrics accurately. Lastly, the machine is space efficient with high-density non-marking rubber wheels that make it easy to transport and store upright when not in use. If you want an incredible rowing experience, this is the right rowing machine for you. It is well built and can take a beating even with heavy sprints such as the HIIT or the Tabata. Also, it is chain driven and retracts no problem even at high speeds. The display is fantastic allowing the user to see clearly at all angles. The resistance is variable based on how hard you work on it and resistance increases when pulled faster and harder. It also comes well packaged and clear from the manufacturer. 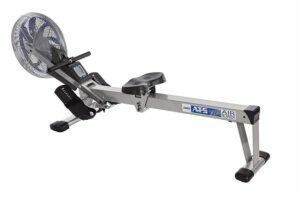 Several features make this rower unique. One is versatile fitness that offers the user a robust, full body workout solution to aid in toning muscles, improving heart health and burning fat. The other feature is its dynamic air resistance with a simple fan-powered cage that makes rowing fun. Also, it comes with an LCD multi-function monitor allowing the user to track speed, distance, time and calories burned while rowing. Lastly, this rowing machine is built for comfort and convenience and comes with built-in-wheels. This is yet another product from Sunny Health and Fitness. 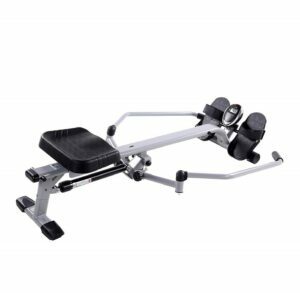 It comes with a belt tension with eight levels of adjustable resistance and an air rower that offers additional strength from the integrated fan offering a dynamic response with every pull. Users can also enjoy when rowing due to the rowing machine’s fully padded seat and non-slip grip handles that offer optimal comfort and support. 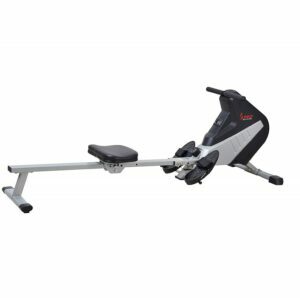 Concerning footing, this rowing machine boasts of large anti-slip foot pedals with adjustable foot straps for improved footing. It is also equipped with a digital computer display for time, count, calories, total count and scan. This rowing machine is sturdy, easy to assemble and the slide is excellent. This rowing machine is from the Goplus Company. The durability and comfort ability of the rowing machine is unrivaled boasting of a high-quality aluminum beam to increase hardness and thickness compared to regular rowing machines. Also, the material ensures that you can use it for a long time without leaving any traces. Ideally, the six wheels that come with the rowing machine ensures that you have a smooth and quiet rowing machine experience. 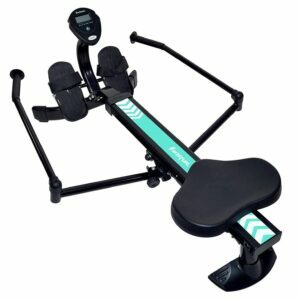 Another outstanding feature of this rowing machine is the adjustable resistance and foot straps. The foot straps come with a magnetic tension system with eight levels of adjustable resistance and the sizable anti-slip foot pedals with adjustable foot straps makes the rowing machine suitable for different people to exercise at different levels. Also, it comes with a bright LCD to ensure that you achieve your workout goals while staying focused during a workout. It is also easy to move and offers you the ease of carrying out a full body exercise. 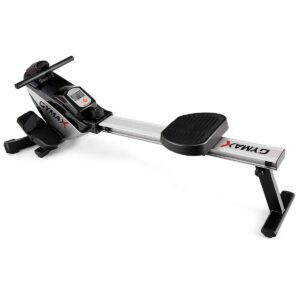 Similar to many products from Sunny Health Company, this rowing machine is the perfect match for an incredible workout. It comes with a digital monitor displaying time, count, calories, total count and scan. The digital console is the right item to enable you to keep in check of all your fitness goals. It is also equipped with foam grip handlebars to increase comfort and endurance in times of long rides. On the feet position, this rowing machine non-slip foot pedals promoting safe footing in times of demanding and vigorous workouts. The foot straps ensure that the feet remain saddled allowing you to focus on the workout without a lack of balance. The transportation wheels are also a competitive feature of this rowing machine. 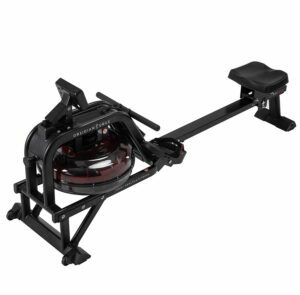 The wheels ensure that you can move the rowing machine by merely tilting and rolling out for use or away for storage without a need for heavy lifting and straining the muscles. Lastly, there is adjustable resistance allowing you to increase or decrease resistance with a simple twist to ensure that the workout remains challenging throughout the fitness journey. It has eight resistance levels to help you achieve your fitness goals. This rowing machine offers the unrivaled user features for an improved workout. First, it boasts of eight levels of adjustable magnetic resistance that allows you to switch up or down the intensity of your exercise with the tension knob. You can increase or decrease resistance with only a simple twist to ensure that your workout remains challenging but effective. For portability, this rowing machine comes with foldable wheels turning any home into a perfect fitness studio. The wheels ensure that the rowing machine is portable. Another incredible feature with this rowing machine is the digital monitor allowing you to track your progress by displaying time, count, calories, and strokes per minutes. The results are meant to keep you motivated and on pace to ensure that you hit your workout goals. Also, this rowing machine is smooth and not noisy at all allowing you to work hard as much as possible on the cardio by going fast and getting your heart rate up or increasing the tension for heightened performance. This rowing machine is intended to help you accomplish your fitness goals. The full movement motion of the arms will ensure that you burn more calories while increasing strength through activation of more muscles in the back, shoulders, and core. Also, it allows you to increase or decrease the workout intensity only with a simple turn of the resistance knob. The LCD digital monitor also allows you to track your strokes, count, time, calories, and total count. The digital monitor also comes with a countdown feature for time, calories and strokes. The Sunny health and fitness SF-RW5639 comes equipped with a hydraulic cylinder resistance. 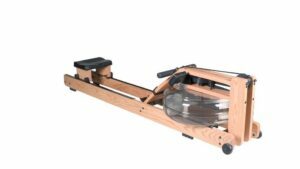 The rower works with fluid for strength and has only one piston, which are cylinders filled with hydraulic fluid engaging when the user pulls back. The amount of energy exerted on this rower keeps your heart pumping providing an intense but an ideal workout. On the foot pedals, the foot straps keep the user’s feet saddled allowing you to focus on the exercise without losing balance. The Sunny Health and Fitness SF-RW1410 boasts of having full motion arms and an LCD monitor. The full motion arms facilitate full range movement with twelve levels of adjustable resistance. Also, the handles are fully padded allowing a full range of motion while giving the user an intense upper body workout. Due to the multiple levels of adjustable tension, you can change the routine or challenge yourself while still on your fitness journey. One incredible thing about this rowing machine is that no matter your level of fitness, you can still achieve fantastic results. Another feature of this rowing machine is the LCD monitor that displays time, count, calories, and total counts with scan mode option. It is easy to read and informative ensuring that you see your progress and meet your fitness goals. It also comes with a cushioned seat to ensure that you get proper blood flow in the gluts for increased working out time and a vigorous workout. The extra padding ensures that it relieves pressure points in the tailbone. 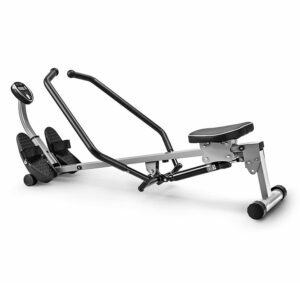 This is one of the best rowing machines from the Harvil Company. It is sturdy enough due to the durable steel frame construction that can withstand a maximum user weight of 250 pounds. It also comes with adjustable hydraulic resistance with a manual control knob. The knob adjusts the tension facilitating easy customization for a workout to fit user needs. The unique arm bar is also crucial to exercise the chest, shoulder, and arm muscles. Ideally, the rowing machine comes with an LCD monitor that displays time, row count and some burned calories. The scan function scrolls through workout metrics every six seconds. The ergonomic design of this rowing machine is unrivaled. It comes with a molded seat for comfort and gliding the users every motion. It also comes with pivoting footplates with safety straps with two straps positions securing any feet size. The design ensures that you row in comfort every time. If you have ever been to a gym, one thing you probably have noted is that rowing machines have increased in popularity. However, as earlier noted, a rowing machine can be intimidating if you do not know how to use it the right way. Some of the most common questions are whether to lead with the legs or arms, whether the shoulders should feel sore, and why the feet keep on slipping out of the straps. The answer to these questions is that a rowing machine is not about power but speed. That is, if you often get a sore back after using a rowing machine, then you are using the wrong technique. Therefore, rather than concentrating on the lower body push yourself out and then gently slide back in for perfect results. Before checking the right procedure, it is crucial that you understand these terms. Strokes per Minute– The strokes per minute refers to the number of times you row in one minute. The number should remain at thirty or less since it is about power and not flinging the body back and forth. Split time– This refers to the number of times it takes to row 500 meters. You should keep it at two minutes or less. When increasing the pace, push out with more power and not just pumping the arms faster. In most cases, the use of a rowing machine can be challenging, but it is an essential tool in spicing up anybody’s cardio routine once you get the hang of it. A rowing machine boasts of being an ergometer, a calorie buster, and a leg core workout machine. If it is not used correctly, it can make the user develop back injuries. However, we have made it easy for you by outlining some of the most important tips while using a rowing machine. Nonetheless, it is important to highlight a few things that you should do before using a rowing machine. -It is essential to wear the right attire avoiding fabric being caught in the machine during a regular exercise routine. -It is crucial to set the resistance at a reasonable level and only to set the machine at two or three if you are a beginner. -It is crucial that you keep the strokes per minute in the low. A rowing machine comes with different approaches to measure workout allowing you to use the change display button for tracking strokes per minute, burned calories, and kilometers traveled among others. If you are a beginner, ensure that the rowing machine is set at a low resistance level until you figure out your limitations. When you do, you can gradually increase the resistance in subsequent rows. Always have your feet secured on the pads and make sure the straps are tight enough to avoid feet sliding. Next, you should slowly raise your knees and slide them on top of the machine. Ensure you are grabbing the handle with an overhand grip but ensure you are not holding it too tightly. Now, pull the handle as you slide to the end of the machine. The legs are to remain straight but slightly bending them at the knees to avoid locking. Now, lean back slightly while pulling your hands up to your chest, holding the handle, so it is straight below the breasts, with elbows pointing down against your slides. This should be the position when beginning and ending a full stroke. At this time, the arms should be moving first then the upper body. The back should remain straight and not slumped with the shoulders, back, and abs engaged as you exercise. When extending out, the upper body position will go from slightly angled back to angled somewhat forward. As you lean your arms and body forward, slide the body forward on the seat by bending the legs. Once you are at the top of the machine, the arms will extend, and legs bend fully. The technique is known as the catch. After the catch comes to the drive, here, you should slide back to the finish position by pushing off with the feet to ensure the legs straighten while the arms are still extending and the body is leaning forward. The driving technique mimics pulling the oars of the water and propelling the boat forward. The drive works out the legs and the core muscles. As the legs continue pushing, the upper body should move to start leaning back. At this point, the arms should return to position. As the upper body angles back, start pulling the handle while bending your arms to ensure the handle ends up back to touching the front of the chest in the position you were when starting the exercise. Still, avoid gripping the handle hard and power should be on the legs since pulling too hard can cause hand blisters. At this point, you should continue practicing the stroke at low resistance until you get used to the position. Mastering leg Isolations- Here, you should start by holding the oars with extended arms, knees bent, and weight on the balls of the feet (the catch technique). With the back straight and core engaged, push back using only the legs, rolling through the feet, so they are flat when the legs are extended. The arms should remain extended in the course of the exercise. Adding arm isolations- After pushing with the lower body for some time, you should start practicing arm isolations. With the legs straight, pull the oar towards the chest. You should bend the elbows out to sides and touch the oar just under the chest. Here, you should continue holding the oar lightly while using the upper back to pull the oar towards you. Engage the same muscles as you do for a push-up or bent-over row. Straining the shoulders by making them do all the work. The fix is pushing the shoulders back and down to ensure there is no tension around the neck area. You should also keep back straight by engaging the core and breathing deeply. Ensure you take deep breaths. Making a scooping motion in the row process. The fix is bending the knees before the arms are entirely extended on the return. Also, the move will ensure that you do not hit the legs with the oar. Since rowing is a chain reaction, making one mistake will lead to many other mistakes. Raising the arms too high- Here, the mistake is pulling the oar up to the chin meaning you will end up using more energy than required. Therefore, to avoid this ensure you are bringing the oar to rest just below the chest. That is, use the upper back muscles to pull the oar towards the chest. In every row, ensure that the elbows are bent at an angle of 90 degrees and forearms should be within the rib cage. Letting the knees drop to the side is a common mistake since it means you are not engaging the inner-thigh muscles or activating the hip flexors. The solution is finishing with the knees in line with the hips. In the process, use the inner thighs to ensure the knees remain close together or zip up the legs to push away and glide in. Holding the grip too hard. That is if you are wrapping your thumbs around the oar or hanging on it as if it is a pull-up bar you are doing it all wrong. Such a grip leads to unnecessary tension in the forearms. The fix is holding the oar with three fingers. The fix is ensuring that you place your hands on the outside of the paddle and not the center. Hold the oar with the first, middle, and ring fingers of each hand. Lastly, every time you are exercising using the rowing machine, use your upper back, not the shoulders, and the biceps. This will ensure you take pressure off your hands. It is crucial to maintaining your rowing machine for a perfect workout in the long-term. Anybody who purchases a rowing machine intends to get the best from it. That is, one intends to use the rowing machine for a long time before it breakdowns. Undoubtedly, a rowing machine has moving parts making it necessary to protect it from premature failures. Usually, a standard rowing machine will have a warranty for a few years and others for a lifetime. However, it is difficult to find the same guarantee for moving parts within the machine. The reason is that such moving parts are subject to wear and tear. Nonetheless, the good thing is that you can increase the life of your rowing machine through proper maintenance. Below are some of the primary and most important tips to ensure that you keep using your rowing machine for a long time. Wipe the rowing machine after use– It sounds basic, but the thing is, most people do not clean rowing machines after use. Usually, a rowing machine or any other exercise machine makes you sweat or subjected under intense workout. Therefore, sometimes sweat gets trapped on the rower which in turn attracts dust. The accumulation of dirt and sweat lead to rusting and weakening the frame. You can avoid such through wiping the rowing machine after use. Chain lubrication with the right product– A rowing machine has a chain that attaches the rowing handle to the flywheel. The chain is intended to move efficiently each time you pull the handle. The efficient and smooth motion is possible when the chain is well lubricated. Accumulated debris will cause problems to the machine and in the process affect the quality of your workout. Therefore, it is crucial to apply a thin coat of oil at least three times a year for a productive exercise. Remove any dirt using a paper towel and automotive greaser. Check for loose screws and tightening them– A rowing machine has many loose parts, which are joined together with, screws. In the process of using the device, the screws might loosen up and later fall off. It is for this reason that rowing machines come with assembly tools to tighten loosening screws. Therefore, to avoid losing essential screws, regularly check the screws and tighten the loose ones. Check for any noises– A broken rowing machine will make a lot of noise. However, it is important to mention that such cases are few. Nonetheless, even the best rowing machine will have loose screws. Therefore, it is essential to check for any noise coming from the rowing machine to ensure that you tighten all screws. In case the machine is broken down, you might need help from a technician. It is crucial to highlight that rowing machines are not all equal. Different manufacturers build their machines differently causing minor variations and the type of maintenance required. Therefore, it is always essential to consider checking the original instructions that come with a rower to see specific instructions necessary to make the best out of your rowing machine.